Back in late August I had a post called 20 bullish charts. 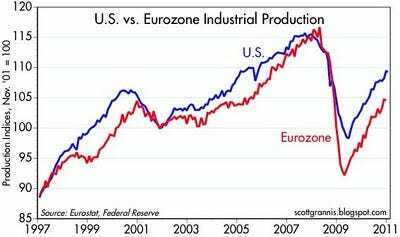 It was meant to counteract all the concerns at the time that the U.S. economy was headed for a double-dip recession, caused in no small part by the sovereign debt crisis in Europe. In retrospect, my timing couldn’t have been better, since equity markets have rallied strongly since their lows at the end of August. As we now face another source of concern with the political turmoil in the Middle East and rising oil prices, I thought it might be helpful to review those same charts plus a few others. 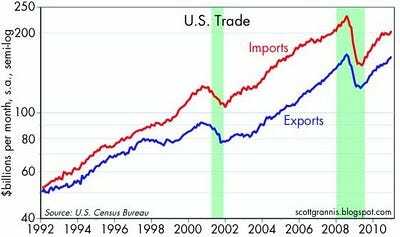 As should be evident, the fundamentals of the U.S. economy remain strong, and this is good reason to expect that the economy will continue to push ahead in spite of the headwinds it faces. This post originally appeared at Calafia Beach Pundit. Industrial production is rising all over the world. Adverse weather resulted in a modest slowdown in U.S. production in recent months, but production was up 8% in the Eurozone last year, and 5% in Japan. 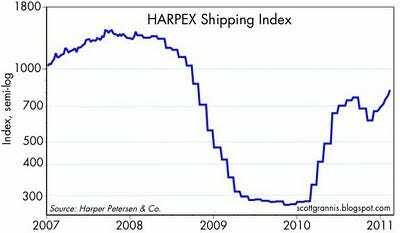 There is still plenty of idle capacity in world manufacturing that can be put to work quickly and cheaply as demand rebounds. 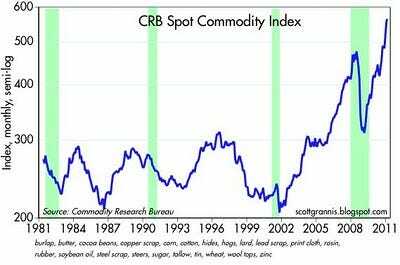 Commodity prices continue to rise across the board, though agricultural commodities appear to have hit a speed bump the past few days. Rising prices reflect strong growth in global demand and/or accommodative monetary policies worldwide. 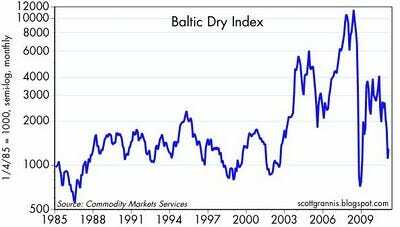 Whatever the case, rising commodity prices all but preclude a bout of debilitating deflation, and rule out the existence of a double-dip recession. 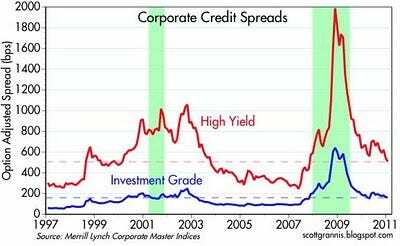 Credit spreads have been reliable leading indicators of recessions in the past, and tighter spreads usually signal improving economic conditions. U.S. credit spreads are now at their tightest levels since the end of the recent recession, confirming that economic fundamentals continue to improve. 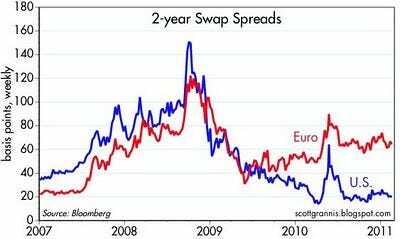 Swap spreads are good indicators of systemic risk and leading indicators of future economic and financial conditions. U.S. swap spreads have been quite low and stable for the past six months, an indication that U.S. financial fundamentals are about as healthy as they can get. Europe remains troubled, however, but Euro swap spreads are not high enough to signal anything more than the likelihood that there will be some form of sovereign debt default in Europe before this is all over, and even should that happen, it is not likely to bring down the Eurozone economy. 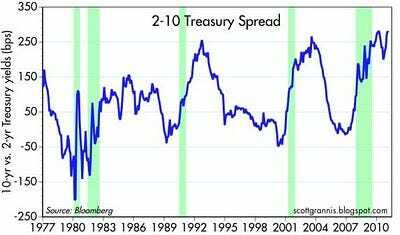 The slope of the Treasury yield curve has been an excellent leading indicator of recessions and recoveries for many decades. 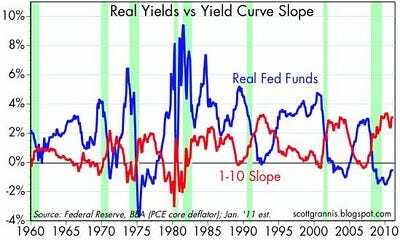 The curve typically flattens or inverts in advance of recessions, but today it is still very far from being flat or inverted--indeed, by some measures the yield curve today is almost as steep as it has ever been. The curve is strongly upward-sloping, which reflects easy money and expectations that monetary policy will eventually need to tighten significantly as the economy improves. We've never seen a recession develop when the curve was this steep and monetary policy was this easy. 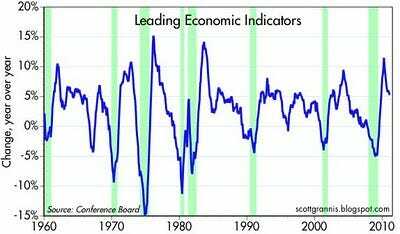 On the contrary, current curve conditions strongly suggest a continuation of economic growth. 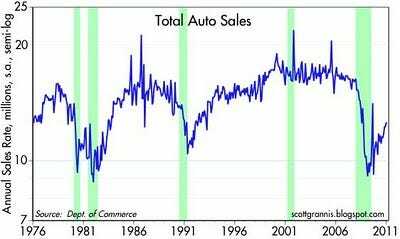 Auto sales have surged at a 16.6% annualized pace since hitting bottom in Feb. '09. This strongly suggests further growth in the economy, and it reflects very favourably on consumers' confidence and financial health. Car sales have consistently exceeded expectations for at least the past year, and that means that manufacturers are continuing to ramp up production targets, and that in turn leads to ripple effects throughout the economy. What's good for Detroit is good for the country. 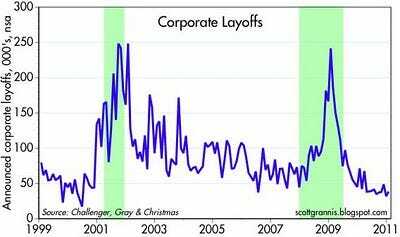 Large-scale corporate layoffs ended almost a year ago. That means corporations have done most or all the belt-tightening they are likely to do. Businesses are lean and mean, and profits are very strong. 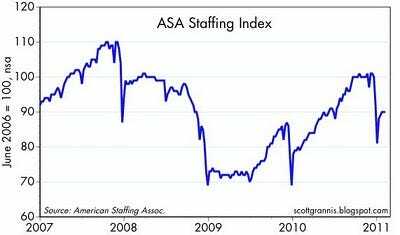 Further improvement in the economy is thus very likely to result in more hiring. It's rare for the economy to stumble when corporate profits are rising. 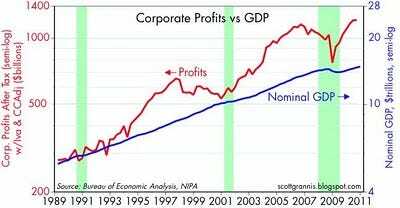 Profits are now at record levels, both nominally and relative to GDP, so it's very likely the economy will continue to grow. As a result of very strong profit performance, corporations are sitting on over $1 trillion in accumulated profits. That could provide a tremendous amount of fuel for future investment, economic growth, job gains, and income gains. Although the Vix index (a proxy for the degree of fear and uncertainty that the market is pricing in) has jumped to 21 today, as of yesterday financial conditions were essentially 'normal' according to the Bloomberg Financial Conditions Index. 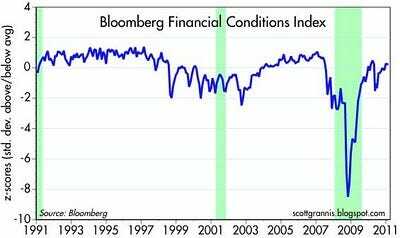 Normal financial market conditions are fully consistent with a healthy and growing economy. 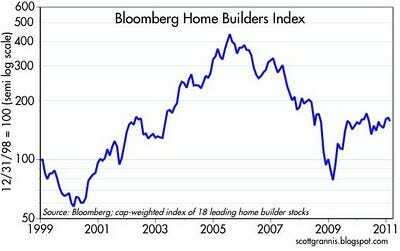 The equities of major home builders have been relative stable for the past year, suggesting that the housing market bust has run its course. 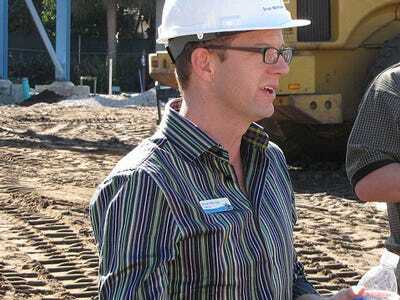 With new construction far below what is needed to keep pace with a growing population, residential construction activity will sooner or later start picking up significantly as housing inventories are depleted and consumers return to the market. 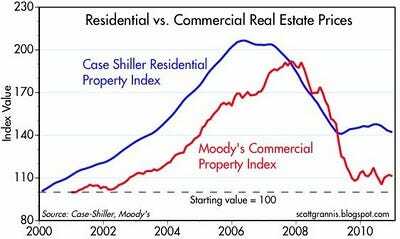 Meanwhile, prices for commercial and residential real estate have been roughly flat for almost two years. This is the sort of action you would expect to see as a market that has been severely overbuilt and distressed slowly consolidates. This chart of commercial mortgage-backed security prices lends strong support to the notion that the real estate crisis has passed and underlying conditions are actually improving quite a bit. 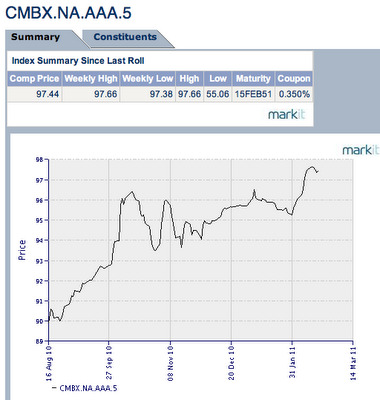 Distressed sales and fears of a deflation/depression pushed these AAA CMBS prices down as low as 55 at the peak of the crisis, but they have since rebounded to just over 97. Why? Because defaults have been far less than was once feared. This chart also points to significant unrealized gains on the books of banks and institutional investors who were forced to write off significant amounts as the prices of securities collapsed, but have yet to declare the subsequent gains in the securities they held on to (i.e., profits at many firms are likely understated). 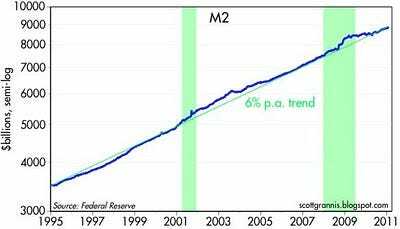 The M2 measure of money supply has been growing about 6% per year on average for a long time. 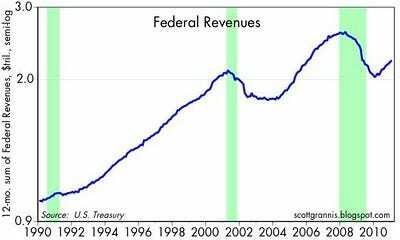 That it continues to do so means that a) there is no shortage of money in the economy and b) the Fed's Quantitative Easing program has yet to result in any unusual increase in the amount of money circulating through the economy. 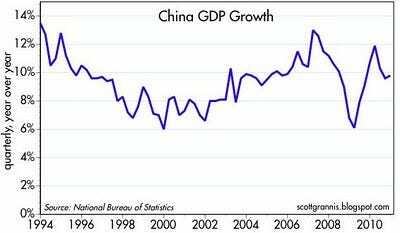 In turn, the latter suggests that there is no reason yet to fear a burst of inflation or an unexpected tightening of monetary policy that could threaten the economy's ability to grow. Although I and many others continue to worry that QE2 will prove inflationary, the jury is still out. 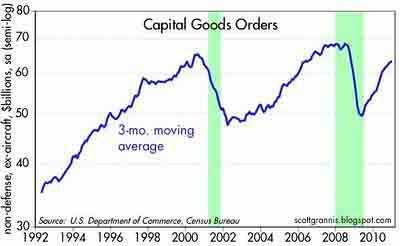 Meanwhile, the Fed has managed to expand the supply of money by enough to satisfy the increased, fear-related demands for it, thus avoiding any risk of deflation. 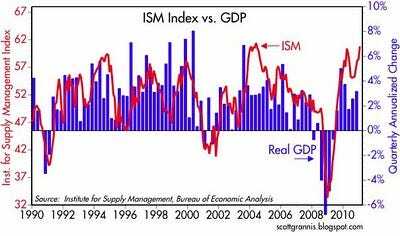 Last but not least, manufacturing conditions according to the Institute for Supply Management are very healthy, suggesting that GDP growth in the current quarter could easily be 4-5%. 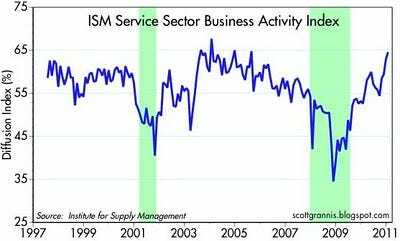 Moreover, since last August we see that conditions in the much larger Service Sector have improved significantly. To top things off, both the manufacturing and service sector surveys reflect substantial improvement in new hiring activity.